As parents, we do things to entertain our kids, to engage with them, to bond and to show our love. It may be something as simple as playing games, making them breakfast in bed for no reason or taking them out for ice cream or a movie. But when they are babies and toddlers, the things aren’t quite so grandiose. When the girls were little, I read to them all the time. There were several books that I read because I loved them (Stinky Cheese Man, anything Dr Seuss and Little Rabbit Foo Foo) and others that were on the top of their lists (Bad Kitty, Goodnight Moon and Little Old Lady Who Swallowed a Fly). 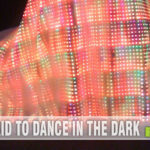 Most were senseless and nonsense but they made us laugh or smile or cry or giggle or whatever. They simply made us happy when we read them together. It was quality time. 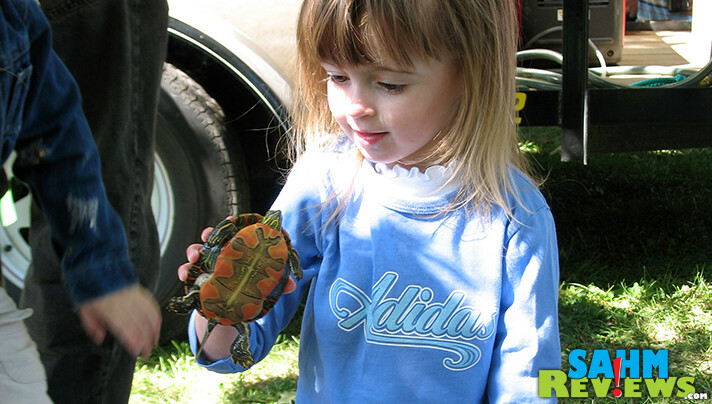 I remember being told over and over (and over) when the girls were born that I needed to introduce them to a variety of things. Cultures, foods, whatever. And read, read, read. “Studies show that kids who are read to daily are (insert whatever opinion the speaker felt was important) so make sure you read to them every day.” I read to them because it was quality time and I loved them, not because I thought it would help them get a leg up in life. Although I did invest in every Baby Einstein DVD and played classical music at bedtime because I was sold on the idea that introducing them to music would be beneficial. Seeing as they are both musically inclined, I have to think that those “studies” were probably right. It’s no secret that science was never my strong suit in school. That hasn’t stopped us from finding ways to encourage the girls to learn about technology, science, environment, engineering, math, computers, robotics and more. 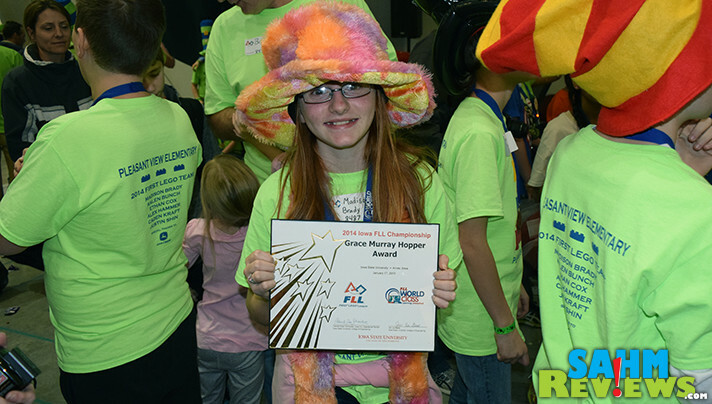 We were thrilled when Madison won the Grace Murray Hopper award at the 2014 Iowa First Lego League Championship tournament. The award is presented to a young woman who demonstrates leadership, creative thinking and poise. It was obvious that her participation in the robotics program provided her with more than just lessons in that subject. Given the choice between two things, doesn’t it make sense to go with the one that provides some kind of long term benefit? Whether real or perceived, in my opinion it does. You’ve heard us rave about Genius Games and how they are making science fun by teaching the concepts through games like Ion, Peptide and Linkage. While their board games are cool, I’m really excited that he’s taken that passion and what he has learned as a new father and provided some reading options that are really educational with My First Science Textbook series. 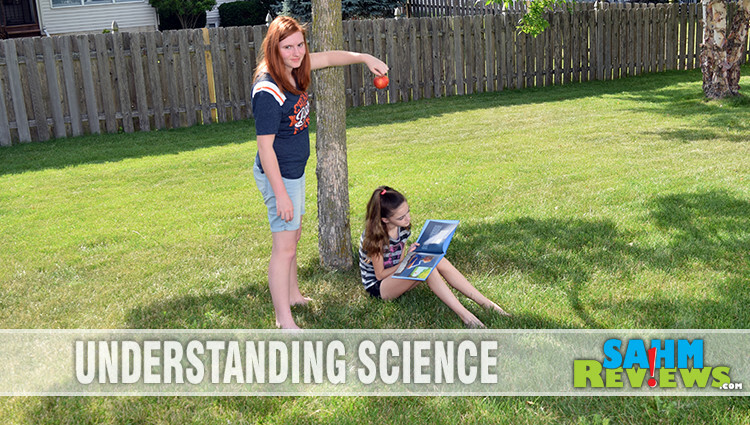 Even if you can’t show that your child is learning, these science topics are sure to stick a little better with whomever is reading these books. Genius Games currently has two different series available. 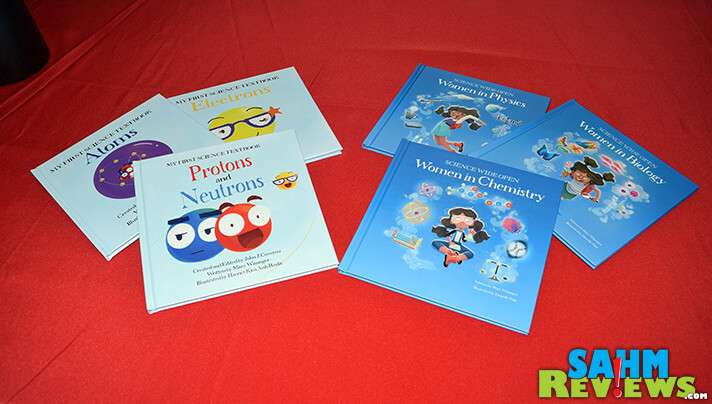 The My First Science Textbook series includes “Protons and Neutrons“, “Electrons” and “Atoms” that showcase each of those concepts while cross mentioning how they interact with each other. The use of non-intimidating words and ideas such as “Our playground is the nucleus and it’s where we like to stay” and the explanation that atoms build everything we see. Like any children’s book, they rhyme and that makes the lesson easier to grasp. 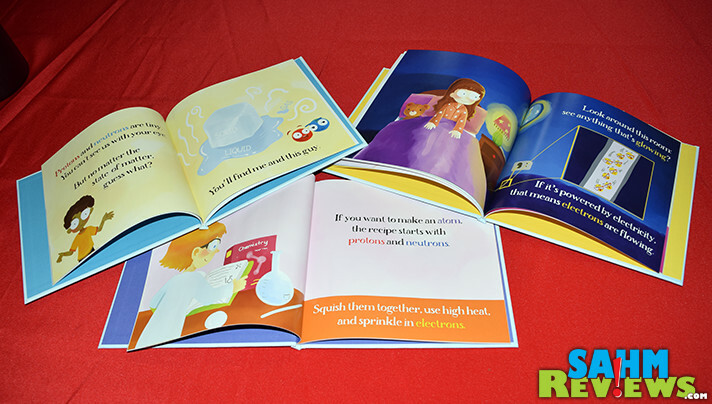 You can get these as board books, traditional hard back or even Kindle! If you are an educator or a parent to young children and are looking for ways to inspire their interest in science, this is a great start. 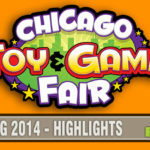 Genius Games continues to do great things in the field of science edutainment so keep an eye on their Facebook and Twitter channels for all the latest news! We’re so excited that they have offered to give away a prize pack that includes the six books we’ve highlighted, including autographs by the author and creator. Enter using the form below! We introduced my niece to many different topics through books and activities. Children love to read (or be read to)! 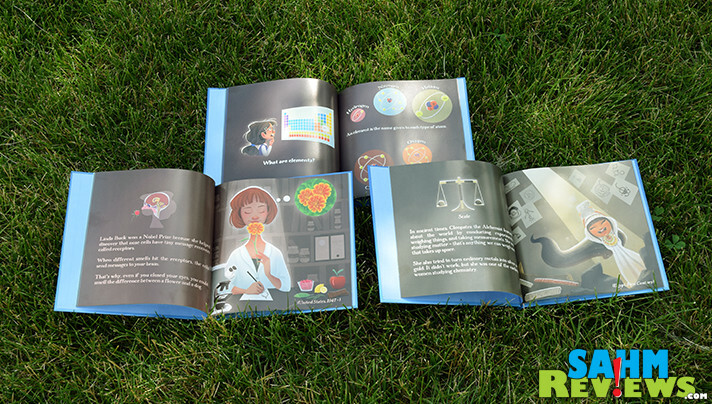 I think that the My First Science Textbook series is a great way to introduce kids to scientific topics and hopefully foster a love of science at an early age. Science was always one of my favorite subjects in school. I would definitely have loved any of these books. I love how they introduce the concepts simply, but accurately, and in a way that young kids can grasp them. I bet my 7 year old daughter would just eat these up. Even though I work in tech, science topics have always been a struggle for me. I love having resources that are written simply for kids by people who have a deep understanding of science! I like how they are simple and colourful for younger kids. These sets would open up an interest in science and great ideas for my grandchildren 3 and 7. I think that the biggest advantage to the My First Science Textbook and Science Wide Open sets is that they are an early introduction to science. It looks like a simple way to get things started and get kids interested in science. The biggest advantage of these books is that they make science look fun and interesting. Most kids would want to know more just by taking a peek inside. I think a big advantage to having these books is that my kids will be able to get a real understanding of science that will help them in school and further on in life. While i was reading your review i also learned that Marie Curie had a sister that won a Noble prize and I think that it is great with these books that the kids will learn things they don’t even learn in school and that is a big plus.